Alfred Thangarajah Duraiappah (15 June 1926 – 27 July 1975) was a Sri Lankan Tamil lawyer, politician, Mayor of Jaffna and Member of Parliament. 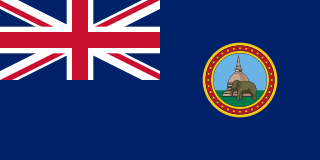 Ceylon was a British Crown colony between 1815 and 1948. Initially the area it covered did not include the Kingdom of Kandy, which was a protectorate from 1815, but from 1817 to 1948 the British possessions included the whole island of Ceylon, now the nation of Sri Lanka. Jaffna Electoral District was an electoral district of Sri Lanka between August 1947 and February 1989. The district was named after the city of Jaffna in Jaffna District, Northern Province. The 1978 Constitution of Sri Lanka introduced the proportional representation electoral system for electing members of Parliament. The existing 160 mainly single-member electoral districts were replaced with 22 multi-member electoral districts. Jaffna electoral district was replaced by the Jaffna multi-member electoral district at the 1989 general elections, the first under the PR system, though Jaffna continues to be a polling division of the multi-member electoral district. The Sri Lanka Freedom Party is one of the major and most well known political parties in Sri Lanka. It was founded by S.W.R.D Bandaranaike in 1951 and, since then, has been one of the two largest parties in the Sri Lankan political arena. It first came to power in 1956 and since then has been the predominant party in government on a number of occasions. The party is generally considered as having a democratic socialist or progressive economic agenda and is often associated with nationalist Sinhala parties. The party follows a Non-Aligned foreign policy but always had close ties to socialist nations.The Sri Lanka Freedom Party is a main constituent party in the United People's Freedom Alliance. Sri Lankan Tamil militant groups rose to prominence in the 1970s to fight the state of Sri Lanka in order to create an independent Tamil Eelam in the north of Sri Lanka. They rose in response to the perception among minority Sri Lankan Tamils that the state was preferring the majority Sinhalese for educational opportunities and government jobs. By the end of 1987, the militants had fought not only the Sri Lankan security forces but also the Indian Peace Keeping Force. They also fought among each other briefly, with the main Liberation Tigers of Tamil Eelam (LTTE) rebel group dominating the others. The militants represented inter-generational tensions, as well as the caste and ideological differences. Except for the LTTE, many of the remaining organizations have morphed into minor political parties within the Tamil National Alliance, or as standalone political parties. Some Tamil militant groups also functioned as paramilitaries within the Sri Lankan military against separatist militants. The Tamil New Tigers (TNT) was a militant Tamil organization founded by Velupillai Prabhakaran on May 22, 1972. The group was composed of a few close associates of Prabhakaran, who was 17 years old when he founded the group. They initially carried out several small scale attacks, including the bombing of a carnival at the Duruapph Stadium in 1972, and several explosions during Prime Minister Sirimavo Bandaranaike's visit to Jaffna in 1974. The group gained notoriety in 1975 when Prabhkaran and three other members assassinated Alfred Duraiappah, the Mayor of Jaffna. Sri Lankan state-sponsored colonization schemes refers to the government program of settling mostly farmers from the densely populated wet zone in the sparsely populated areas of the dry zone in the North Central Province and the Eastern Province regions near tanks and reservoirs being built in major irrigation and hydro-power programs such as the Mahaweli project to create farming and fishing communities. Since irrigation settlements in the North Central and Eastern Provinces occurred under direct state sponsorship, as most of these farmers are ethnic Sinhalese it appeared to many Tamils as a deliberate attempt of the Sinhalese-dominated state to marginalize them further by decreasing their numbers in the area. It has been perhaps the most immediate cause of inter-communal violence. Vettivelu Yogeswaran was a Sri Lankan Tamil lawyer, politician and Member of Parliament. Cathiravelu Sittampalam was a Ceylon Tamil civil servant, politician, Member of Parliament and government minister. Subaiya Natesan was a Ceylonese politician, Member of State Council, Member of Parliament and senator. Ponnuthurai Sivakumaran was a Sri Lankan Tamil rebel and the first Tamil militant to commit suicide by swallowing cyanide. Kathiripillai Thurairatnam was a Sri Lankan Tamil teacher, lawyer, politician and Member of Parliament. Sivasubramaniam Kathiravelupillai was a Sri Lankan Tamil lawyer, politician and Member of Parliament. Vallipuram Nallathamby Navaratnam was a Sri Lankan Tamil lawyer, politician and Member of Parliament. Visvanathan Dharmalingam was a Sri Lankan Tamil politician and Member of Parliament. Chellappah Suntharalingam was a Ceylon Tamil academic, politician, Member of Parliament and government minister. Thambaiyah Mudaliyar Sabaratnam was a Ceylon Tamil lawyer, politician and member of the Legislative Council of Ceylon. Chinnaiah Arulampalam was a Sri Lankan Tamil politician and Member of Parliament. Alfred Leo Saverimuthu Thambiayah was a Ceylon Tamil businessman, politician and Member of Parliament. Thamodarampillai Ramalingam was a Ceylon Tamil lawyer, politician and Member of Parliament. Arumugam Thiagarajah was a Sri Lankan Tamil teacher, politician and Member of Parliament. Rasamanohari Pulendran was a Sri Lankan Tamil politician, Member of Parliament and state minister. Mylvaganam Mudaliyar Subramaniam was a Ceylon Tamil lawyer, politician and member of the Legislative Council of Ceylon and State Council of Ceylon. Emmanuel Rasanayagam Tambimuttu was a Ceylon Tamil lawyer, politician and member of the Legislative Council of Ceylon and State Council of Ceylon. 1 2 3 4 5 6 7 8 Arumugam, S. (1997). Dictionary of Biography of the Tamils of Ceylon. pp. 50–51. ↑ "Directory of Past Members: Durayappah, Alfred Thangarajah". Parliament of Sri Lanka. 1 2 "Masked gunmen kill Jaffna Mayor Shot dead outside temple". Daily News (Sri Lanka) . 26 May 2009. Archived from the original on 4 June 2011. ↑ Palakidnar, Ananth (4 October 2013). "Varatharaja Perumal Kovil robbed". Ceylon Today . Archived from the original on 16 February 2015. ↑ "Past Mayors". Jaffna Municipal Council. Archived from the original on 18 October 2013. ↑ "Result of Parliamentary General Election 1960-03-19" (PDF). Department of Elections, Sri Lanka. Archived from the original (PDF) on 9 December 2009. ↑ "Result of Parliamentary General Election 1960-07-20" (PDF). Department of Elections, Sri Lanka. Archived from the original (PDF) on 9 December 2009. ↑ "Result of Parliamentary General Election 1965" (PDF). Department of Elections, Sri Lanka. Archived from the original (PDF) on 9 December 2009. ↑ "Result of Parliamentary General Election 1970" (PDF). Department of Elections, Sri Lanka. Archived from the original (PDF) on 9 December 2009. ↑ "Acrimony at inaugural JMC meeting". TamilNet . 24 April 1998. 1 2 3 Sabaratnam, T. "Chapter 3: The Unexpected Explosion". Pirapaharan. Ilankai Tamil Sangam. 1 2 Rajasingham, K. T. "Chapter 24: Tamil militancy - a manifestation". Sri Lanka: The Untold Story. ↑ Feith, David (2013). "Chapter 10: Separatism in Sri Lanka". In Cabestan, Jean-Pierre; Pavković, Aleksandar. Secessionism and Separatism in Europe and Asia: To Have a State of One's Own. Routledge. p. 169. ISBN 978-0-415-66774-6. ↑ Coomaraswamy, Radhika; Perera-Rajasingham, Nimanthi (2009). "Chapter 6 - Being Tamil in a Different Way: A Feminist Critique of the Tamil Nation". In Cheran, R. Pathways of Dissent: Tamil Nationalism in Sri Lanka. Sage Publications. p. 121. ISBN 978-81-321-0222-9. ↑ "Colombo remembers Alfred Duraiappa, setting hands of the clock backwards". TamilNet . 30 July 2009. ↑ "Now Daya Master in Alfi's party!". Ceylon Today . 25 June 2013. Archived from the original on 16 February 2015. ↑ Nakkawita, Wijitha (15 February 2009). "Prabhakaran's victims: From Alfred Duraiappah to babes at Visuamadu". Sunday Observer (Sri Lanka) . Archived from the original on 16 February 2015. ↑ Ferdinando, Shamindra (13 October 2010). "Who could have shot Duraiappah at Varadaraja Perumal temple, Ponnalai?". The Island (Sri Lanka) . ↑ Perera, Janaka (26 July 2008). "Mayor's murder at Vishnu temple". Asian Tribune . ↑ Hoole, Rajan; Thiranagama, Rajini (January 2001). "Chapter 2 – Antecedents of July 1983 and the Foundations of Impunity". Sri Lanka: the arrogance of power : myths, decadence & murder. University Teachers for Human Rights. pp. 11, 46. ISBN 978-955-9447-04-7. ↑ Sabaratnam, T. "Chpaper 8: First Military Operation". Pirapaharan. Ilankai Tamil Sangam. ↑ "27 July 1975". Peace and Conflict Timeline. Archived from the original on 16 February 2015. ↑ Athas, Iqbal (1 August 1999). "The Situation Report". The Sunday Times (Sri Lanka) . ↑ Rajasingham, K. T. "Chapter 25: War or peace?". Sri Lanka: The Untold Story. ↑ "Renovated Jaffna Stadium opened". TamilNet . 2 March 1998. Savumiamoorthy Thondaman *This list is unfinished.